Egyptian President Morsi is due to visit Berlin tomorrow. Critics call on German chancellor Merkel to address urgent problems such as the ongoing violence and the precarious situation of refugees in the Sinai. Morsi’s first official visit to Germany on wednesday will be accompanied by diverse protest. In an appeal to Angela Merkel, Amnesty International (AI) called on the German chancellor to place issues of human rights on the agenda. Two years after the ousting of president Mubarak, AI sees “no essential improvements” of the human rights situation in Egypt. Against the background of the ongoing violence, main points of concern are the unresolved role of the police forces and the armee (including the practice of military courts) as well as German weapon exports to Egypt (at a total worth of 74,2 billion Euro in 2011). Both small fire arms and armored vehicles bought from German companies have reportedly been used to break down on protesters in Egypt. AI therefore demands an imediate stop of any weapon exports to Egypt. AI calls for demonstrations in front of the chancellery at Willy-Brandt-Straße/ Paul-Löbe-Allee between 11am and 2pm. Meanwhile, expatriate copts from Egypt together with networks for the protection of religious minorities call for demonstrations at the same place, starting at 12pm. They accuse Morsi of obstructing juridical steps to protect copts from religious persecution. 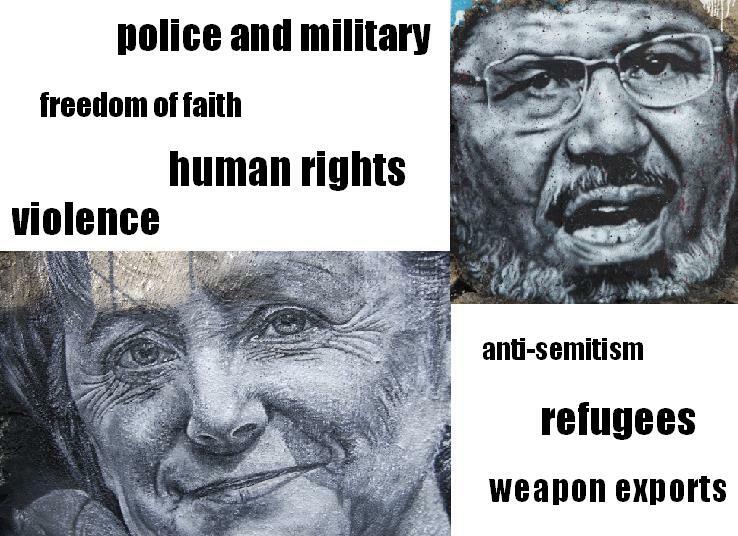 The International Society for Human Rights has initiated silent vigils in the cities of Berlin, Frankfurt, Hamburg, Düsseldorf, Stuttgart and Bonn and reminds Merkel of the fact that Morsi still hasn’t renounced his anti-Semitic statements. Another critical point is the situation of refugees, particularly on the Sinai peninsula. Since the fall of president Hosni Mubarak and the precipitous decline of Egypt’s domestic security operations, parts of the Sinai Peninsula have turned from poorly controlled to downright lawless. As the German government has admitted in an answer to a parliamentary inquiry, officials are aware of human trafficking, organ trade and cases of protection racket committed by criminal gangs in the Sinai. Human rights group pro Asyl pressures Merkel to address the precarious situation of refugees in Egypt who are most vulnerable to criminals. Appealling President Morsi, pro Asyl calls for political steps to secure refugees access to the UNHR – a right they are often denied by Egyptian police. Sinai – a Powder Keg for Egypt’s next President? Declaration of solidarity with the protesters in Tahrir Square at Stauffenbergstraße, Berlin-Tiergarten close to the Egyptian embassy from 6pm to 8pm.